First of all, I’d like to apologize for my seven month sabbatical from posting here. Things have been really hectic in both good and bad ways. In the bad category was B’s grandmother (Mimi) passing away due to ALS (more on that later) and her father needing open heart surgery. In the good category, my oldest (NHL) had a fantastic first year in high school. He’s really making us proud with how amazing he’s doing. JSL is doing wonderfully also, having graduated from elementary school. He’s also turning into quite the writer. He even bought a Chromebook with saved birthday/Chanukah money to better write his stories. When writing stories, inspiration is both the most important component and the hardest to obtain. You can spend months unable to think of anything to write. Then, out of nowhere, you can get ideas for a dozen stories. I’ll often read through Reddit’s Writing Prompts subreddit. There, people will post ideas for stories and other people will write short stories based on those ideas. I’ll admit that I don’t often write stories there, but the story prompts are great. One day I’d love to do a series of short stories based on Reddit Writing Prompts. Unfortunately (or fortunately), my writing schedule is booked. Awhile back, I wrote a short story based on a Reddit Writing Prompt: Ding Dong Demon Ditch. In it, a demon needs to deal with the fact that he was summoned and the kids who summoned him ditched him. I liked the story, but felt like there was a bigger tale to tell there. Still, I was working on the sequel to Ghost Thief. Around this time, I was getting ringing in my ears. I found out that this is due to hearing loss and I might need a hearing aid. It turned out that I didn’t get one. A hearing aid would have cost me over $1,000 and wasn’t guaranteed to stop the ringing. The audiologist explained that the hearing aid would play white noise to help my brain filter out the ringing. I countered that my phone had a free app for that and I could buy a $30 Bluetooth headset to use instead of a $1,000+ hearing aid. So I did just that and it did help. The ringing would annoy me until I plugged my headphone in my ear. Then I’d get the sweet relief of white noise stopping the ringing. That’s when it hit me. What if there was some kind of noise that made people happy? Not just normal happy either, but insanely, drop everything and listen to this 24/7 happy. From that humble white noise beginnings, a story began to take shape in my mind. At first, it was a technology based story. I had the basic idea but no real plot or characters. Then, I had another breakthrough. I realized I could use characters from my Demon story in this. From there, not only did a story quickly form, but an idea for a full series of stories. These aren’t going to be novels like Ghost Thief, though. I figured that potential Ghost Thief readers might want to see other writing I did to decide whether they want to put down money on my book. Therefore, these are going to be novellas. I’m going to release them in weekly chapter installments. When the entire story has been released, I’ll post a full version to more easily read the whole way through. 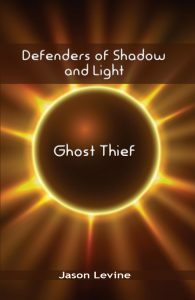 I’m juggling the Ghost Thief sequel and this tale, so I don’t know when it will be released. It shouldn’t be too long, though. Keep an eye out for my short story series: Demon Investigations. Hey TechyDad! I couldn’t agree more, sometimes to be able to write, paint and do things, we need inspiration. I’m glad you found yours 😉 Looking forward to reading your short story series (or did I missed it? ).